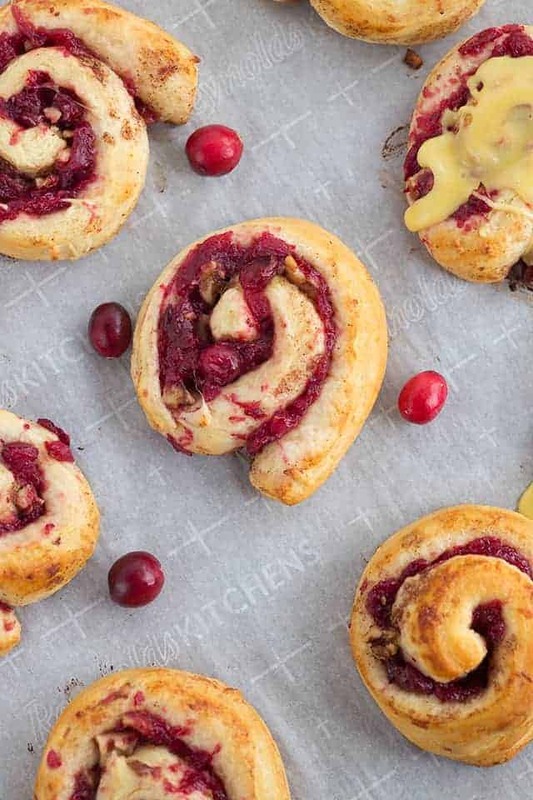 These cranberry orange rolls are semi-homemade cinnamon rolls. 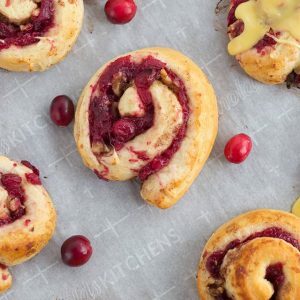 They have a cranberry pineapple spread that’s been cooked down and spread on the inside of the store-bought orange cinnamon rolls. 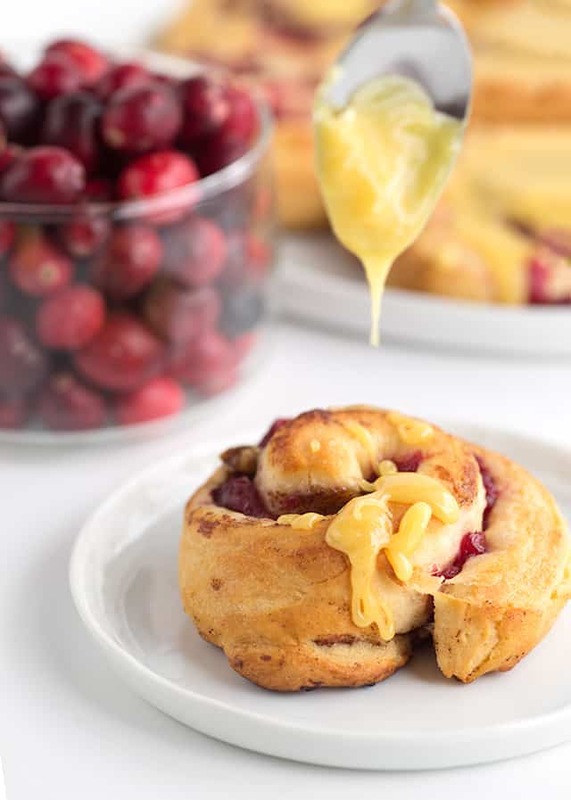 The cranberry pineapple spread really amps up the flavor of the rolls. 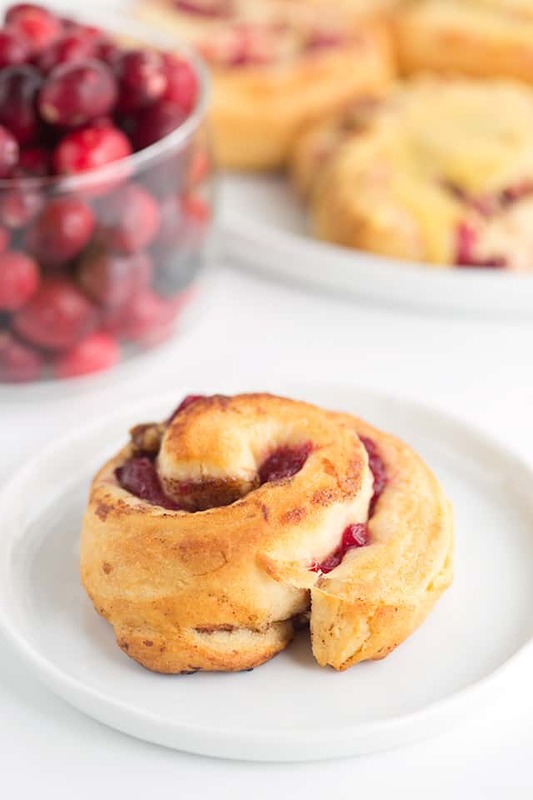 Hurry up and grab some fresh cranberries and make these addicting rolls! Do you remember back in my crescent roll apple nutmeg dumplings post I was talking about the 48th Pillsbury Bake-Off® Contest? Well, the winners have been chosen for each of the 4 categories. In case you’re wondering, the categories are cozy breakfasts, appetizers for any party, dinners with heart and no-fuss desserts. Did you enter? The next step in the contest is for the grand prize winner reveal. You can catch that on Food Network’s The Kitchen Saturday 2/24 at 11am ET/10am CT. I can’t wait to see which winner will receive the kitchen makeover from GE Appliances, $50,000 in cash, and gets to appear on an episode of The Kitchen, as well as in Food Network Magazine. This is one of the category winner recipes! Woohoo. I can see why it was a winner because it’s creative, unique, but still incredibly simple. Did I mention it’s delicious? The other winning recipes were for Cookies and Cream Caramel Layer Bars (which I want to make too), Oktoberfest Pizza, and last but not least Toasted Spinach Pesto Ravioli. I’ve made cranberry orange recipes before. Never once have they tasted this amazing! Adding pineapple, ginger ale, and ground ginger (ginger is one of my favorite flavors) definitely was a huge contributing factor. I think the story behind these rolls is even sweeter than the rolls themselves. Food has a way of connecting us with our past, especially sweet childhood memories. The winner has taken two things that remind her of the holidays with her mama and daddy and combined them into the perfect cozy breakfast. 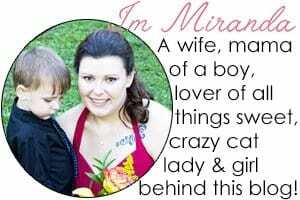 She talks about the cranberry salad that was at every holiday dinner. She adapted the recipe to go into the orange rolls that her mother and herself took to after visiting her sister. She happily bakes these rolls that you see here to remember her parents and the holidays they had together while creating new memories. 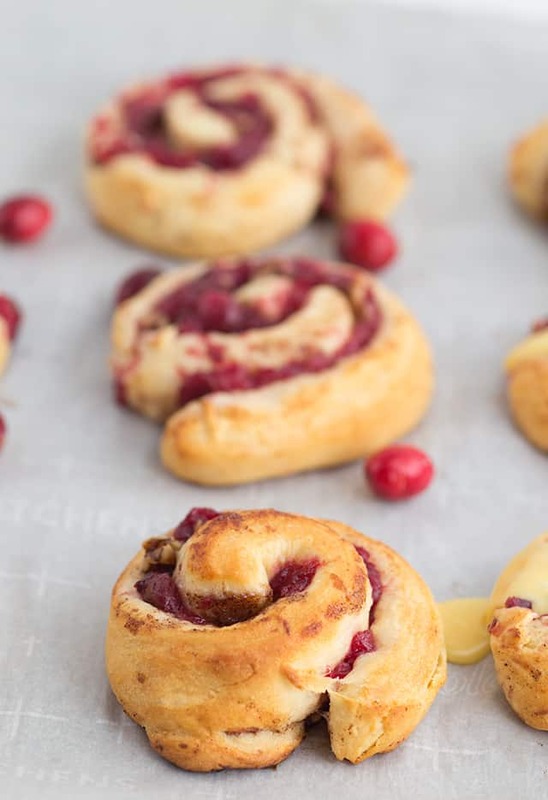 These cranberry orange rolls are filled with a cranberry pineapple ginger filling. They're studded with chopped walnuts and baked until golden brown. They're finished with a drizzle of orange icing. In a large saucepan, add in the cranberries, pineapple, ginger ale or beer, orange juice concentrate and ground ginger. Place over medium high heat for 9 - 14 minutes stirring constantly until the liquid is absorbed. The mixture will be very thick. Remove from the heat and let cool for 20 minutes. In a small skillet, toast walnuts for 4 to 6 minutes over medium heat. Continuously stir to avoid the walnuts burning. Remove from the heat. 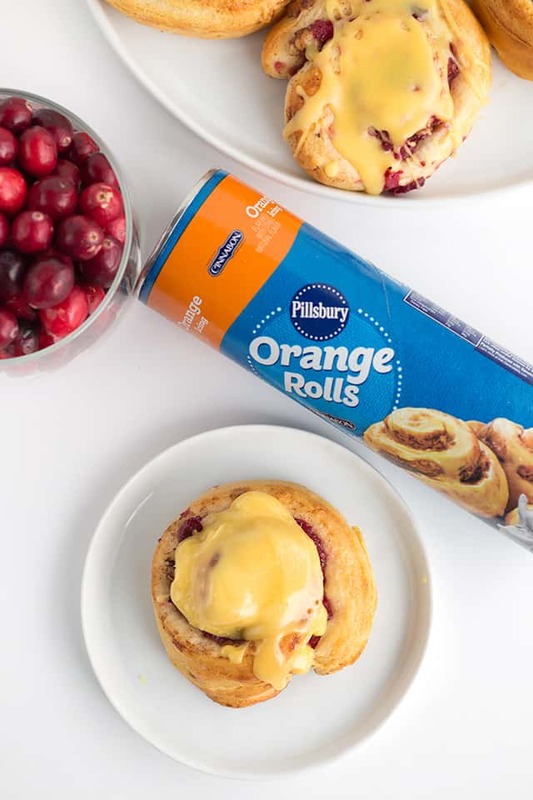 Open the can of orange rolls without separating the rolls. Set the icing aside. Lay the dough on parchment paper or cutting board. Carefully unroll the dough. Add dollops of the cranberry pineapple mixture on the dough. Spread it out to cover all of the dough. Sprinkle the toasted walnuts on top of the cranberry pineapple mixture. Carefully roll the dough back up as tight as possible. Using a serrated knife, cut along the perforated lines. Clean the knife with a paper towel after each cut. Place the rolls 2 inches apart on the prepared cookie sheet. Place into the oven and bake for 9 to 13 minutes until golden brown. Spread icing on the warm rolls. Oh man! I can’t believe they’re not in Canada! Come on over!